I haven’t been to San Francisco in about 5 years and I am finally heading back, a Birthday gift from my boyfriend (of course I gave off the hint, found a great deal, and said baby this is what I want for my birthday). Okay well it went something like that…. This year has gone by fast, this year many things have changed and we are about to embark in a new beginning, 2011. Every year we try to make new memories by going somewhere new. Last year my boyfriends birthday present was Seattle. Yes I gave him Seattle 🙂 — Seattle is so beautiful that we have even thought about possibly moving there someday, but for now we continue in our home town Miami, waiting for the next adventure — This year — My birthday — This year — San Fran! Today I am boarding a plan — I am sure I will let you know about the experience and the TSA and how all that went later, but today I’m boarding a plane to San Francisco, one of the most beautiful cities I’ve ever been to, filled with cold air, rain, beautiful skylines of the bay and great people. 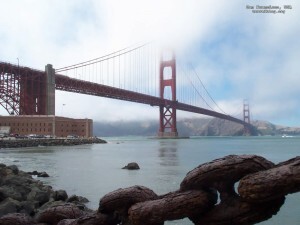 I do not know that I would ever want to live in San Francisco but I do love to visit.